Sonoris's innovative plug-in designs prove that not all digital equalisers sound the same. There has been a fair amount of discussion on Web forums recently about the common origin of most digital EQs in a single 'bi-quad' algorithm, and hence of the possibility that, as it is put, "all digital EQs are the same”. Of course, this is a bit of an over-simplification, and even if it was theoretically true, there would still be practical reasons for different choices of software. Different EQ plug-ins package this algorithm behind different user interfaces, and often add extra features, such as reproducing the non-linear aspects of certain famed analogue EQs. The two EQ plug-ins under review here have other ways of separating themselves from the herd. Both sound good, look good and have nice clean and open interfaces, but, as we will see, the Sonoris Mastering EQ attempts to up the ante over its competition with its tremendous clarity and flexibility, and the Parallel EQ does the same with its special sound. Both are intended mainly for mastering and whole-mix EQ, and for this review that's how I used them. Some of the Mastering EQ's wilder possibilities would only be needed in real nightmare scenarios: for instance, except for problem cases in restoration projects, I have never yet had to EQ the left and right sides of a stereo mix differently. But others could quickly find a place in the workflow. For example, if you have a mix that has a lot of unmusical subsonic movement around 25Hz, where the low end of the guitars is both preventing them from speaking out clearly and making the low end too diffuse, and where the bass or kick are a bit overwhelming, it's easy to see how you might want to high-pass filter that whole mix, but then have different low shelves for the Middle and Sides signals, or perhaps apply a shelf to the Sides and a bell cut to the Middle. You might also want to brighten the top end of the (Middle) vocal 'whisper' around 3kHz without wanting to add anything to the (Sides) guitars which, now you come to think of it, really are a bit harsh between 2.5 and 4 kHz and so probably actually need a mild dip at just that point. Now, you wouldn't necessarily want to do this kind of intrusive messing about all that often — for effective EQ, always ask 'What have I just made worse with that move?' Nor might you want to do it all at this early stage of the processing: in general, I tend to EQ first for problems, then later in the chain for sweetening. But the point is that if you ever did want to do this, the Sonoris Mastering EQ would let you, and all within the same single plug-in instance. It would let you audition the results of your choices too, as the monitor outputs can be fed either from the stereo output or any of the M/S/L/R choices we've mentioned, and swapped over at the touch of a virtual button. As you would expect, the range of cut and boost on each band is quite considerable (±18dB), and the bandwidth of the bells quite beyond anything an analogue EQ could even dream of (from 0.1 to 4 octaves). The filters have switchable slopes of 6, 12 or 24 dB/octave, and the shelves also have an extremely useful adjustable slope parameter with the same range as the bells. At 0.1, that makes for an extremely gentle shelf (with the frequency set at 100Hz, the shelf reaches all the way up to around 2kHz) whereas at the other end of the scale, the steepness of the shelf brings in an adjacent boost/cut — a very steep boost at 100Hz will create a dip just above that frequency, and vice versa. In a number of situations, this could be just what is needed. In my own Philosophers Barn Mastering studio, the normal processing chain starts with outboard digital EQ, before the signal is sent into the analogue chain. I use either a Massenburg Design Works EQ in one of the engines of the TC System 6000, or an outboard Weiss EQ MkII (which has a linear-phase option), and so for the purposes of this review, I simply substituted the Sonoris Mastering EQ in their place. The reason for putting high-quality digital EQ at the beginning of the chain is obviously so that the signal can be tidied up, if necessary, before any other processing. If, for example, the programme material requires a high-pass filter, most often this is best applied before it hits any compressors, which would otherwise be reacting to the frequencies that need to be attenuated. And, of course, this doesn't exclude doing any sweetening at the same time; in fact, doing sweetening EQ very early in the chain can mean that it sounds more 'integrated' later on. 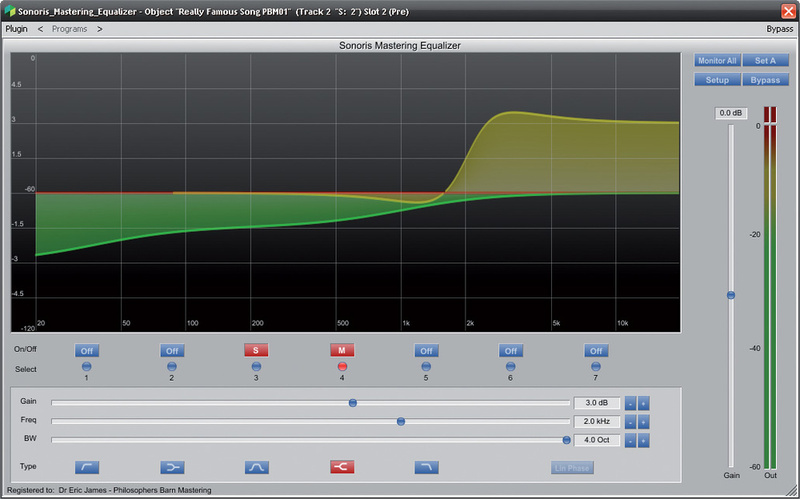 In this role, the Sonoris Mastering EQ performed extremely well. The variable high-pass slope and variable low shelves made cleaning up the low end of most mixes pretty straightforward. The M/S function works well here: although I pretty much always used the high-pass to process both channels, it was sometimes better to use a shelf on the Middle channel only, to shave off and shape up centred bass and kick without losing those frequencies from the sides. The same goes for clearing up low-mid muddiness: sometimes you want to be able to clarify the vocal by taking off some of the resonances that can build in the 200 to 300 Hz region, but taking that frequency range away from, say, side guitars, would very quickly make things sound rather thin. Although I prefer to sweeten programme material at a later stage, for the purposes of this review I experimented with 'transplanting' a sweetening curve and a sweetening shelf from the later stage to the very first stage of processing in the SMEQ, and this worked surprisingly well. Just to push the boat out even further, I tried combining minimum-phase low-end control with a linear-phase sweetening shelf. As I mentioned before, this avoids the problems with low-end distortion in linear-phase designs and, in the right circumstances, can capitalise on the ability of linear-phase EQ to give a brighter but slightly softer picture of the high end. 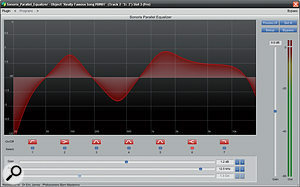 On those occasions when I was running a full processing chain, I found myself preferring to work, as normal, with the sweetening at the latest stage, but when I was using really minimal processing, as I do with some jazz and classical mastering sessions, I found that using one instance of the Sonoris EQ could be sufficient for all my mastering EQ needs. I should point out here that this tremendous flexibility does not, as I had feared, come at the price of a really heavy CPU load, though it is appreciably more intensive in linear-phase mode and at the higher quality settings. Also, I find that in Magix Sequoia some plug-ins glitch if there is not enough of a 'dead area' on a file before the waveform, but the Mastering EQ worked very well in that respect (as an Object-based EQ) and never stuttered at all. I should also point out that although transparency is a virtue — and, for problem-solving EQ, a necessity — it isn't always the main requirement, and there are things you can do with, say, a Maselec or API EQ that you cannot reasonably expect to be able to do with an EQ like the Sonoris Mastering EQ. It simply isn't designed to provide either grit or euphonic distortion, and it doesn't do so. In contrast to its stable mate, the Sonoris Parallel EQ has much less flexibility. The filter shape is fixed for each of its seven bands: the first and last are high- and low-pass, the second and sixth are shelves, and the third, fourth and fifth are parametric. There is no linear-phase option, and each instantiation of the EQ can only be either stereo, M, S, L or R, meaning that two instances would have to open for full M/S processing. But what makes the EQ interesting instead is the eponymous topology of bands two to six. These five filters operate in parallel, and hence each is working with a 'clean' signal rather than one already affected by a previous filter, as would be the case if they were operating in a conventional series configuration. The result is exceedingly clear and musical. During the time when I was reviewing the SPEQ, we had a very interesting project on our books. A series of live recordings of the soprano Joan Sutherland performing at the Sydney Opera House in the 1970s had been digitised and needed some repair, care and attention. There was a slight dullness to the recordings, which wasn't helped by the need for broadband noise reduction, and there was also a fairly evident muddiness. The SPEQ turned out to be the perfect choice for dealing with both. The EQ was static for the whole of each performance, and it was quite easy to raise the sound quality by a considerable margin using just three bands: a high-pass filter around 28Hz, a mild dip at 330Hz, and a broad mid-range boost centred on 3kHz. At the other end of the genre spectrum, I found that the SPEQ was also very useful for post-processing touch-up. We had mastered a beautiful electronica project and the producer was very happy with the result, but the mix engineer had a few slight reservations on some tracks about the overall sonic signature. The original mastering, using analogue processing, had aimed mainly at increasing textural clarity, and the mixer thought that in places maybe a slightly warmer approach might be better. He didn't want huge changes, and as the producer didn't want any and there wasn't the time or budget to re-run the whole of the analogue processing, I decided just to add some additional EQ to the already mastered (but as-yet unlimited) tracks and let them argue amongst themselves. Again, the SPEQ came up trumps: a slight bump at 165Hz and a even slighter dip at 1.2kHz achieved a result that was slightly warmer but with no loss at all of textural detail. These are top-notch digital EQs. They take an individual approach to the task and each achieves something rather special: the Mastering EQ in its tremendous flexibility and ergonomic advantages, the Parallel EQ in its gentle clarity and wonderful ability to retrieve detail. For the price, they seem to me to be a bargain, especially as they are available as a bundle from Sonoris at a special price of around £300. My pet peeve with many plug-ins has always been the use of control paradigms such as rotary knobs, which work well for analogue hardware, but far less effectively with a mouse. For my money, the most ergonomic means of interaction with the mouse are buttons, numerical fields and sliders, especially those which 'return to zero' when double-clicked. Consequently, I really like the graphical user interface for the Sonoris EQs. They present a clean and uncluttered interface which is common to all of the Sonoris plug-ins (including the new SMC Mastering Compressor), and is widely scalable, so it can be dragged to its fullest (considerable) size for adjusting the EQ settings, and then minimised to take up much less screen real estate. The vertical scale is also switchable, and you can choose to have it display a 4.5dB, 9dB or 18dB range simply by clicking on the main part of the screen, which then toggles through these options. For mastering purposes, I left it at 4.5dB — psychologically very useful! The GUI also features a real-time spectrum analyser — which, according to the engineer you talk to, is either an essential part of the processor, a useful adjunct to the main features, or a piece of misleading eye-candy which can (thank heavens) be permanently switched off by the seasoned pro. I have pretty firm views myself on the uses of analysis tools in mixing and mastering, but I do not use them much myself in my day-to-day work. In any case, it should be noted that the Sonoris analyser is not ideally suited to EQ'ing programme material by eye, even if that were a good idea. It is either on or off and has no smoothing adjustments, so cannot be tamed in the various ways that, for example, the free Voxengo Span analyser can. Although it presents a detailed picture of the moment-by-moment spectral content, it's not so useful for the kind of information about trends and tendencies which might be needed for programme correction, and is less generally informative for these purposes than, say, the analyser in FabFilter's Pro-Q. It's not, I think, a deal-breaker, though. On the right-hand side of the screen are four buttons. The first of these, in the Parallel EQ, allows the user to choose which channels to process (with stereo programme material, you can select left or right, middle or sides separately if you wish). The others allow you to save and load user presets (Sonoris have the good sense not to provide any of their own), toggle the Analyser on and off, toggle between two different A/B EQ settings, and bypass the EQ entirely. In the Mastering EQ, the controls are similar, but because it can process each channel separately, the Process choices are replaced by monitoring choices, and it has additional settings for the LP Mode and Upsampling. Finally, below these buttons are an overall output level control with a ±18dB range and an output meter. Mastering EQ is immensely flexible. Parallel EQ is superbly clear. The Sonoris equalisers offer something that is both different from the herd and a bit special. Both are true mastering-quality plug-ins, at attractive prices. Mastering EQ €249; Parallel EQ €199; EQ Bundle €380.80. Mastering EQ $330.22; Parallel EQ $263.91; EQ Bundle $505.02.